Robert Mondavi was legendary in the development of the California wine industry. In 1966, he, his eldest son, R. Michael Mondavi, and family founded the Robert Mondavi Winery in the Napa Valley with the goal of producing wines that would rival the finest wines of Europe. 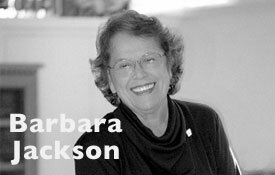 Barbara K. Jackson was a founding philanthropist of the Mondavi Center. Along with Larry and Rosalie Vanderhoef and Robert and Margrit Mondavi, Barbara Jackson helped give life to the dream of a performing arts center on the UC Davis Campus – a dream first described by Chancellor Vanderhoef at his inaugural convocation. Jackson's generous gift to name the Center’s largest performance space as Barbara K. and W. Turrentine Jackson Hall played a significant role in launching this great performing arts center. Since 2010, Jackson's love for opera and philanthropy have combined to make the Barbara K. Jackson Rising Stars of Opera concert free to the public. A generous endowment will insure the continuation of this annual concert. In addition, Barbara’s philanthropy reached out to support other disciplines at UC Davis (the Music and History Departments); other arts organizations in Sacramento; and young opera artists through the Adler and Merola programs at the San Francisco Opera. A soft-spoken administrator whose management mantra was “listen, listen, listen,” Chancellor Emeritus Larry N. Vanderhoef led UC Davis for 25 years—first as provost/executive vice chancellor (1984-1994) and then as chancellor (1994-2009). That quarter-century is arguably the period of UC Davis’ greatest physical and academic growth. Vanderhoef made good on an inaugural promise to build a world-class performing arts center at UC Davis—just one of numerous state-of-the-art facilities constructed on his watch—and led the university itself to a more prominent place on the world stage. Thousands of Interstate 80 commuters daily pass by his realized vision of an impressive and welcoming new south entry to the Davis campus, including the soaring Robert and Margrit Mondavi Center for the Performing Arts, the Robert Mondavi Institute for Wine and Food Science, a conference center and hotel, and the Jan Shrem and Maria Manetti Shrem Museum of Art.